Of all Capri's panoramic walks, the Pizzolungo is, arguably, the most breathtaking of all. 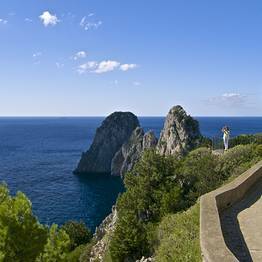 The footpath, which hugs the southern coast of the island, offers a succession of quite amazing views of the sea, the Sorrentine peninsula and the Faraglioni. 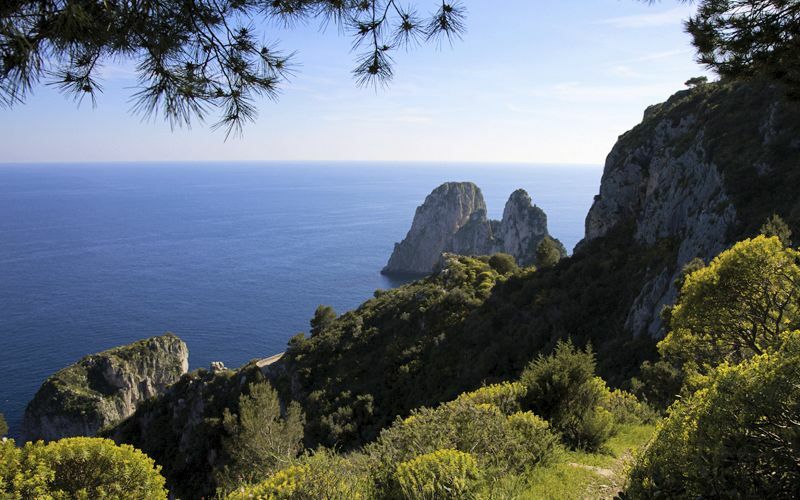 Once beyond the center of Capri, visitors are likely to meet only the occasional fellow walker as they make their way along this spectacular coastal path, experiencing the views, the perfumes and the sounds of the surrounding nature and the sea in near to total solitude. 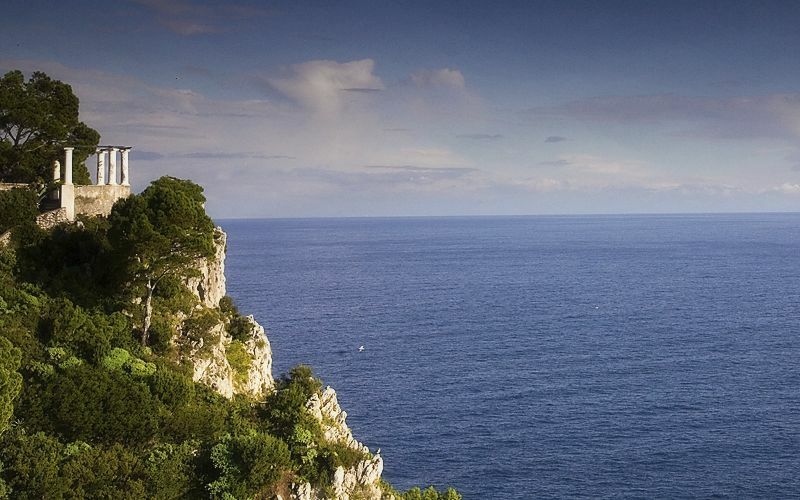 Walkers are advised to wear comfortable shoes and make sure they have a supply of water (and a camera!) with them. From the Piazzetta, those heading to the Pizzolungo can take either Via Longano, or Via Le Botteghe. 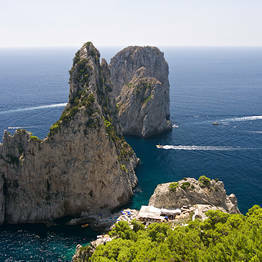 Both roads are typical of the picturesque historic center of Capri, lined with tiny little shops and restaurants and with characteristic medieval arches and alleyways. 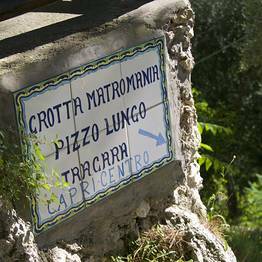 At the crossroads with Via Tiberio, walkers should proceed along the Via Matermania, which cuts through a peaceful residential area of Capri, to the Piazzetta dell'Arco Naturale, where the restaurant, Le Grottelle, is located. 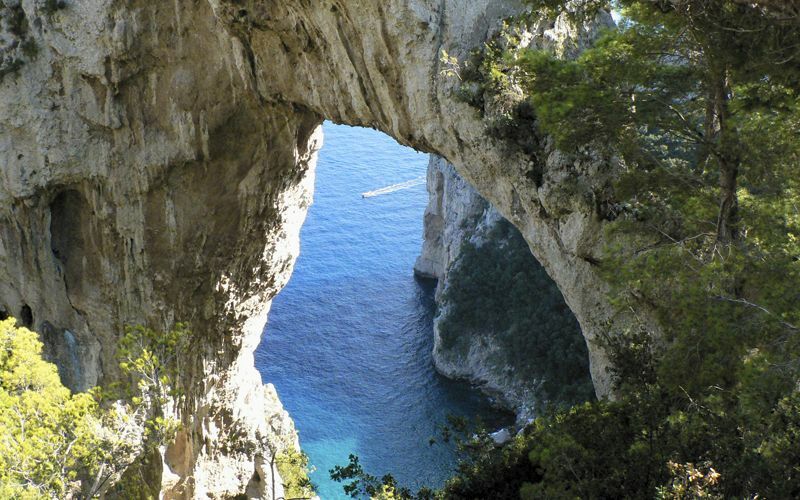 Here visitors will want to make the brief detour to see the Natural Arch, a magnificent rock formation reached via a little track which commences in the immediate vicinity of the restaurant. Having seen the arch, walkers should head back towards Le Grottelle and, just before reaching the terrace of the restaurant, take the steep flight of steps descending all the way down to the Grotta di Matermania, a cave in which, in ancient times, rituals in honor of the gods of the wood were celebrated. 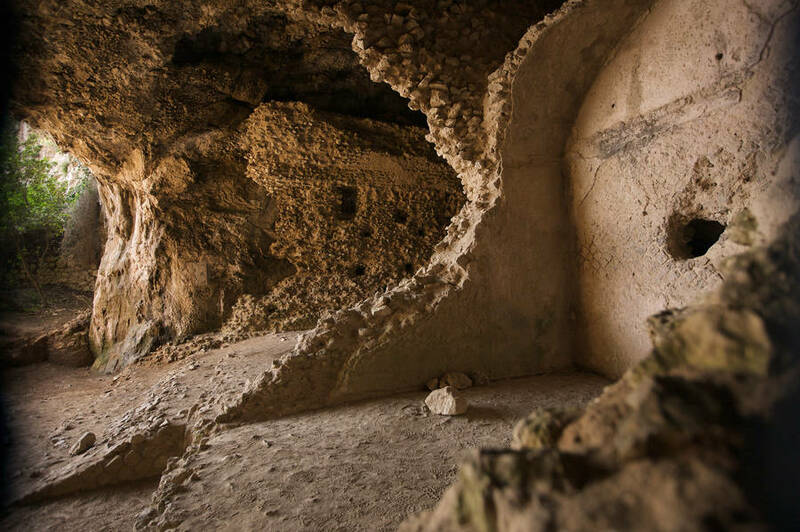 From the Grotta di Metermania, the Pizzolungo path snakes its way through the coastal vegetation, past solitary houses and tiny pathways through the woods, many of which lead to enchanting viewing points. 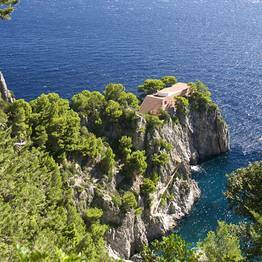 The most famous of the villas along the Pizzolungo route is, without doubt, that built for the writer Curzio Malaparte. 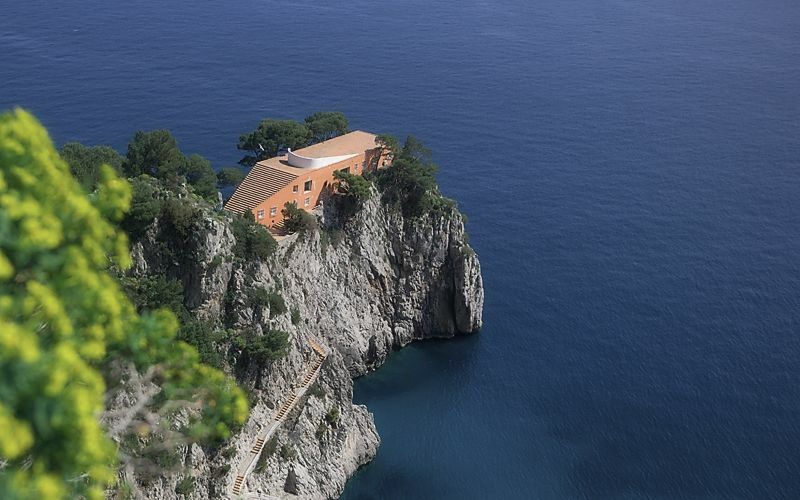 This bold work of modern architecture was designed by the Italian Rationalist architect, Adalberto Libera, and completely dominates the rocky spur of Punta Masullo. The walls of the rectangular shaped villa were originally painted in deep blood red. 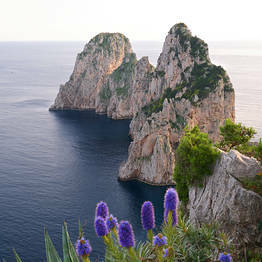 Over time, the salt sea breeze has bleached the exteriors to a less daring shade of pink. An external flight of steps leads up to the roof terrace complete with white, crescent-shaped, free standing wall. The interiors of the villa, center around a large living room featuring four enormous floor to ceiling windows, each of which offers a different view of the sea. 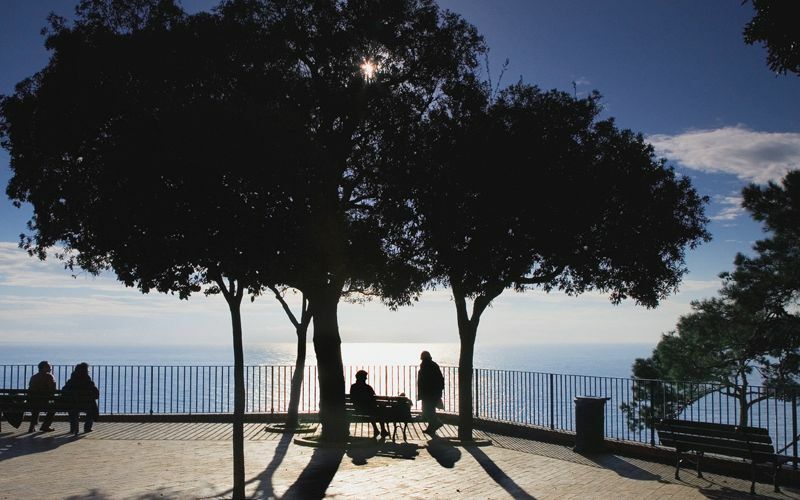 Taken at a leisurely pace, the Pizzolungo walk can last anything from 2 to 3 hours and concludes at the Tragara Viewpoint, overlooking the Faraglioni and Marina Piccola. 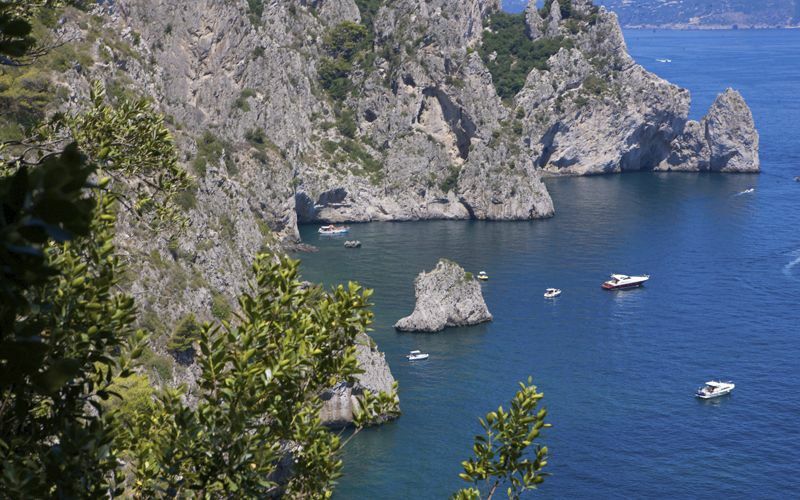 Just before the viewpoint, there is a tiny path leading down to the "da Luigi" restaurant and the "Fontelina" bathing establishment, both of which are situated on rocky platforms at the foot of the Faraglioni. 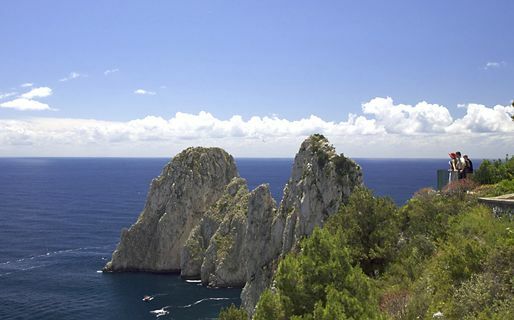 We head back towards the Piazzetta of Capri by way of Via Tragara, walking past elegant residences and luxurious hotels, all set in fabulous Mediterranean gardens; and Via Camerelle, famous for its exclusive boutiques and designer fashion shops. 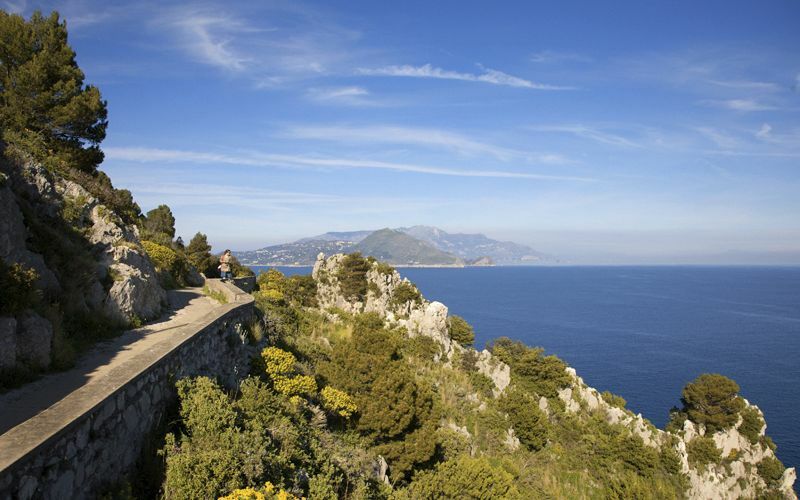 Once in Via Camerelle, the 14th century Charterhouse of San Giacomo and the Gardens of Augustus are within easy reach, accessed by way of Via Federico Serena, situated to the right of the Grand Hotel Quisisana. 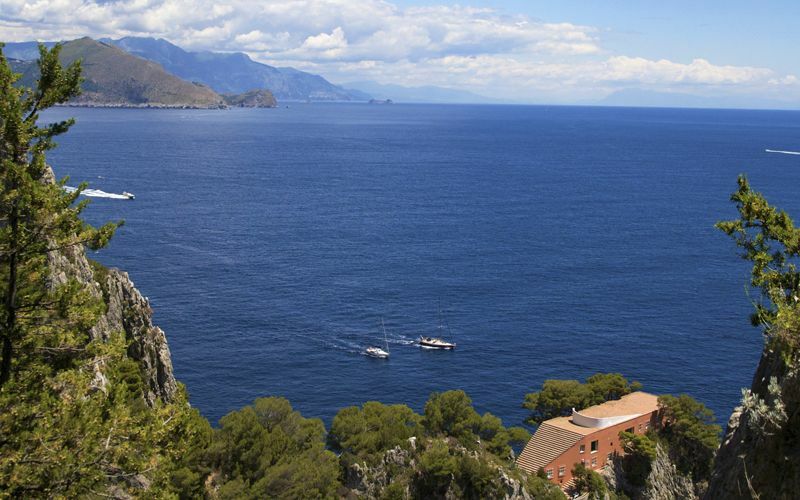 From the panoramic terraces of the Gardens of Augustus, fabulous views of the bay of Marina Piccola, the Faraglioni and the spectacular Via Krupp can be seen. 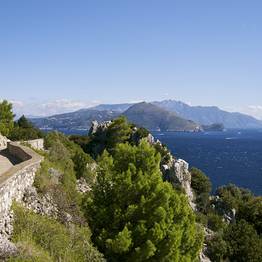 Even after the Gardens of Augustus have closed (in the late afternoon), visitors can still enjoy the walk along the nearby pathways, which cut through the Mediterranean shrub, shaded by beautifully scented coastal pines.